You can now use eClass to prepare a spreadsheet that can be imported directly into Bear Tracks as a part of the new electronic grade submission process. To use this capability, you must be the instructor or TA of a credit section on eClass. 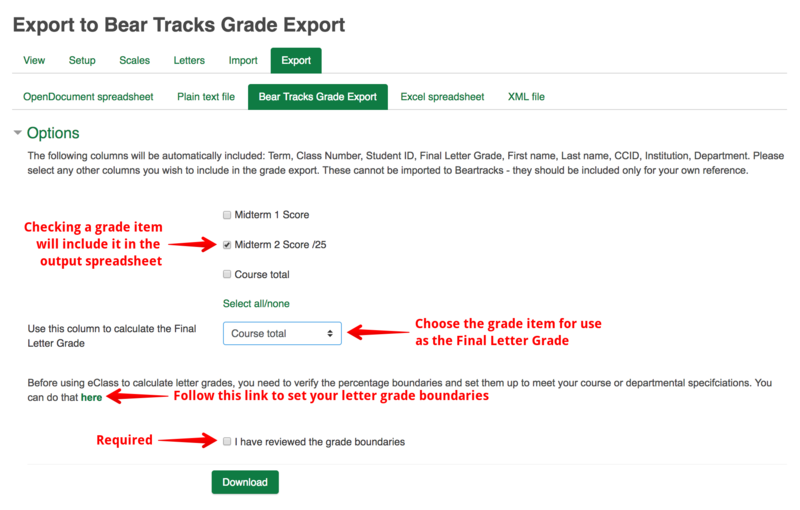 To perform a Bear Tracks export, your gradebook must be set up. You need to have a column where the students' final grades have been calculated. This column can be any column in the course (ie. it does not need to be the 'course total' column) and does not need to be displayed as a letter grade. You will select the column to be used to calculate the final letter grades during the export process. 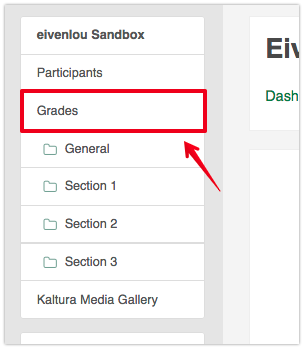 If the column with the final score for your students is numeric, the final letter grades will get calculated automatically during the export based on the letter grade boundary distribution that you set up for your course - if you have not already done this, you must do so using the following article: Setting Letter Grade Boundaries. 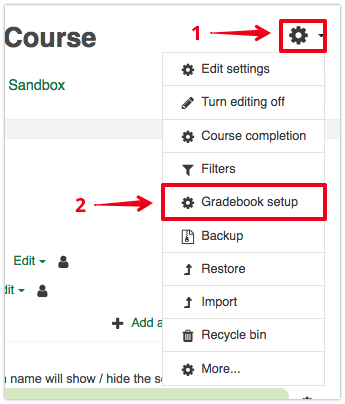 Once you are on the Grade administration page, make sure you are in the Bear Tracks Grade Export tab, under the Export tab. This will open the options page for the export. If you want to use a column other than the Course total to calculate your letter grades, you should set it in the Use this column to calculate the Final Letter Grade dropdown box. You can also choose to include any or all of the other columns in your gradebook for your own information by checking beside them - these will not be uploaded into Bear Tracks. Note: You will need to verify your letter grade boundaries and check the required box before you are able to click Download to save the file to your local machine. Once downloaded, you can edit this file (as long as you save it in the same format.) For example, you might do this if you want to manually enter the final letter grades for your students and not have moodle run the letter grade calculations. Once you have prepared your spreadsheet, you can then upload this file directly into Bear Tracks following the tutorial available from AIS here. To access this training, you will need to login with your CCID and password to gain entry to the Peoplsoft training. Once your login is successful, you should see a step by step tutorial for Uploading a Learning Management System (LMS) final grade file. The Faculty of Extension has put together a tutorial for uploading and submitting grades (Step 1 will not apply if you have exported your grades from eClass) here.